The PS-PSR and PSR2 tanks are recommended for storing heating water from various sources of energy, like gas boilers, wood-fired heater, central heating cookers, etc. The fittings are on the front of the boiler to facilitate connection to additional tanks. 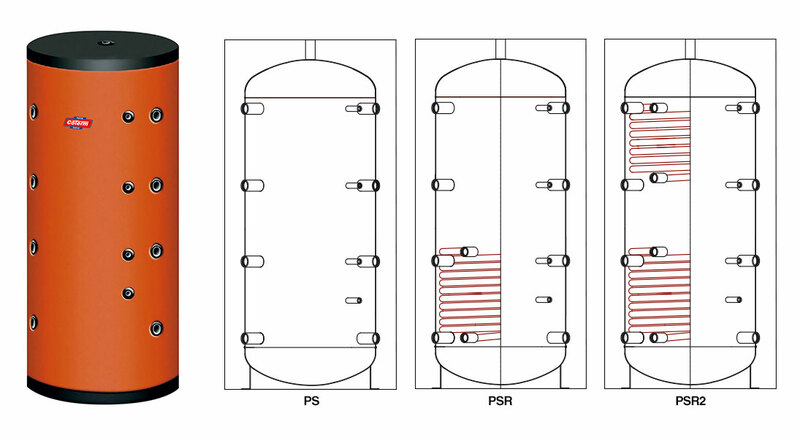 The PSR and PSR2 models are equipped with either one or two fixed coils to be connected to a solar energy system. The inner part of the tank is unfinished, while the exterior is painted with a water-based rustproofing. Insulation is in 50-75-100 mm-thick soft polyurethane, while the exterior shell is finished in PVC. Thermoformed PS top cover for models up to 1000 litres, with black PVC for larger models. Fill in the form below to be e-mailed the PS – PSR – PSR2 SERIES BOILERS technical data sheets. Thank you.